Whenever I return to this blog to look at things I wrote about in the past, more often than not it is the non-political posts that I re-read, perhaps because now that I am paid to write about economic and politics, the writing on sport and movies and music still has the appeal of a hobby - which is what this blog only ever was. This week I did get to write in Guardian Aus on tennis and while that was fun, I decided to write another post here because this week a few people on Twitter had reminded me of things I had written about Federer in the past. And on looking back over the posts I realised, I just have to write another post after this win. For you see I have written a bit on Federer. The first time was in 2008 when I commented on his winning the US Open that year meant he had avoided in the eyes of some critics a failure - because after 4 years where he had won 3, 2, 3 and 3 slam titles respectively, in 2008 he was merely a semi-finalist at the Australian Open and runner-up at the French Open and Wimbledon. Now sure, 2008 was in some ways a nadir for Fed. The French Open flogging he received from Nadal was otherworldly. He met the greatest clay court play at the absolute height of his powers, and was destroyed, winning only 4 games in 3 sets. But he won the US Open in 2008, and went on to make the finals in the next 5 grand slams, winning 3 of them. I was already waxing pretty lyrical about Federer then. I can't remember whether I had read David Foster Wallace's NY Times article on Federer that he wrote in 2006, but nonetheless I was certainly already in the spirit of those Fed articles that are now so prevalent across the web, given the title was "the effortlessness of gods" . I wrote that one reason Federer was held in higher regard than others such as Nadal (Djokovic was a one slam winner at this stage, so not in the conversation yet) was that he achieved what he did with (to quote Harold Abrahams in Chariots of Fire) "the apparent effortlessness of gods". I still think that holds up. Yeah we love sportsmen and women who win, but we always hold those who seem to do it with ease, just that bit higher. Last night I stayed up till 1:30am watching Roger Federer play a game of tennis. I don't think I'll ever have to do that again. But now that Federer has won the French Open; and now that he has equaled Sampras' record of 14 titles I don't feel such a need to will him over the line. Perhaps now I can relax and just enjoy watching him play, rather than live every point and worry when he gets down 15-30. Wimbledon starts in a month; and we'll see, but I'm betting I'll be setting the DVD recorder going rather than looking at the clock and thinking "I have to get up for work in 5 hours..."
Lets just say I lost that bet. - seven and half years later, 3 grand slam titles later, and I am still living every point and still worrying when he gets down 15-30. By 2011 I had taken a different tack. When Federer lost in the Wimbledon quarter finals to Tsonga after being up 2 sets to love, I decided to compare him to The Beatles - suggesting his glory years were akin to the run of The Beatles going from Rubber Soul to The White Album - wherein everything in popular music was changed. I argued his loss to Tsonga was the equivalent of him releasing "Let it Be" - ie not that great and basically meaning the end was nigh. I suggested it showed that his decline was not a blip, but that his time as the very best player ever - and more so as a player whose game was so far above all others it changed the way the game was played - was over. Tennis fans, and especially Federer loyalists, will hope that there is time for an Abbey Road – that one last Grand Slam where the stars align and for 7 matches he comes back. It is more likely to happen than not. And so it did come to pass. In 2012, when he beat Murray in the Wimbledon final I wrote that "Federer releases Abbey Road" (which of course was released before Let it Be, but recorded after - just to fully ensure the analogy is mangled). And just to demonstrate how wrong I was in 2009 about not caring, I watched that final in a small cabin in Port Macquarie on a little portable TV, while on holidays. And it wasn't 1:30am, but 3:15am that I stayed up till watching. I also spent most of the match standing up because at one point while Federer was facing break point I happened to stand up, and when he saved the point and held serve, I decided that I needed to remain standing in order to help him win. Yeah, I'm that deranged when it comes to Federer. When in 2013 he then lost in the 2nd round at Wimbledon to Sergiy Stakhovsky I suggested he had released his first solo album. And so last night we saw what happens after the band splits up. Out comes the disappointing solo album. In this case it is more “McCartney” than “John Lennon/Plastic Ono Band”, but in either case it was a long way from the magic that once was. Will Federer release an “Imagine”? Who knows. He still seems to love playing, and he can still at times sing on a tennis court in a way that reminds you that this guy was once better than anyone else ever has been. Well it was a long wait, but on Sunday, Federer released "Imagine"
It's an analogy that I think works particularly well, because like Lennon's album, Federer's win against Nadal in 5 sets will likely be over-rated. I believe his win was among the toughest he has ever had to do - beating 4 players in the top 10 to do it, and comeback down a break in the 5th against his longest and perhaps only nemesis, after not playing a tournament in 6 months? How do you do that? How do you do that at 35 years of age? But even still, the tennis he played was not relatively speaking a patch on the glory years. It was certainly great and because sport always moves forward Federer 2017 would beat Federer 2005, but back then he was doing things with the racquet that had never been done - and more than that, had not been dreamed of being done. In the past fortnight he was "just" doing things as well as anyone else. And while "Imagine" the song is the favourite of many of Lennon's fans, the impact of the song on world culture was nothing compared to that which he wrote with McCartney in 1963-67. But by God, like "Imagine", that 5th set will be for many who saw it as the peak of Federer's career. I thought he was gone. But then I didn't rate him a chance to beat Berdych in the 3rd round. Federer's 1st and 2nd round matches were the text-book definition of "rusty", and even though he beat Rubin in straight sets in the 2nd round, I thought his game pretty poor. I still thought he'd probably lose to Nishikori in the 4th round. And when he lost the 4th set, I really thought he'd let a big chance slip, because by that time Murray had been knocked out and so too had Djokovic. By the time he played Wawrinka in the semi-final I was in full "well he's done so well to get this far" mode. And after he lost the 3rd and 4th sets I was in full trying-to-convince-myself-it-doesn't-matter-all-that-much mode, life is still good, I told myself. To be honest I didn't want him to play Nadal in the final. I knew he would of course. I knew that would happen from the 4th round on wards. Of course Federer would make the final and of course he would face Nadal and lose. Pessimist that I was I was actually preferring he lose to Wawrinka in the semis than make the final and lose to Nadal. But he played against Nadal the way he should always have played against Nadal - attackign and stepping in to hit his backhand, rather than trying to slice or just out-rally Nadal. For so much of the match it all seemed on Fed's racquet. The points felt like they were either Federer winner or Federer unforced error. Nadal of course did hit winners - 35 to Fed's 73 - and of course he did force a lot of errors, but the overall tone of the match was of Nadal remaining solidly good and Federer being very good, then very bad, then very good, then very bad. The first 4 sets were not to be honest great tennis. The Nadal-Dimitrov match was better viewing. None of the set required a player getting to 7 games. No tie breakers. It was 4 sets where both players took turns wining it comfortably - hardly a classic. But then Lennon's Imagine has a few dud tracks (does anyone ever hum "Crippled Inside", or "It's so Hard"? But then came the 5th set, when both players were amazing at the same time. That is tennis played by gods. And of course Federer was down break points when serving for the match. Long time Fed watchers know he always makes you earn it. He doesn't get broken often while serving for the set or match, but he rarely seems to do it easily. The scars of the break to Djokovic in the semis at the 2011 US Open will never quite heal. At 30-40 in the final game Federer unleashed an inside out forehand winner that long-time followers should have predicited. Despite facing a couple more break points, that shot took me right back to 2009, when against Tommy Hass in the 4th round of the French Open, when down 2 sets to love and facing a break point at 3-4 he let rip the same inside out forehand for a winner. For me Federer is the greatest of all-time, not because of the number of titles, but because since 2003 men's tennis has been viewed through the Federer lens, in much the same way as women's tennis since 2002 has been viewed through a Serena lens. You either had to develop a game as attacking as Federer's or come up with one that could defend his attacks for long enough to break him down - this is the path Nadal, Djokovic and Murray have taken; Del Potro and Wawrinka took the more attacking route (though Djokovic better than anyone perhaps ever in history is able to turn defence into attack). I will of course be greedy for more wins and will get nervous and spend half of matches standing up or sitting in a certain way, but to be honest, I can't see Sunday night being topped for emotion. And so now to the graphs. Now looking at that graph might have you thinking that if Djokovic keeps going at the same trajectory he has for the past couple years, he will reach Fed's 18. But it also shows how tough it is to win once you hit 30 - the age Djokovic (and Murray) will be by the time of the French Open. The graph also suggests Djokovic will struggle to get to Federer's total because he came good a couple years later than did Federer. After he broke through beating Tsonga in the 2008 Australian Open, Djokovic did not make another final until the 2010 US Open (he lost to Federer). But once he won the 2011 Australian Open, he like Federer did, got a taste for it. His peak had a bit more of a "lull" than did Federer's, but after winning just once slam each in 2012, 2013 and 2014, he got his full mojo back and won 6 out of 8, including the incredible 4 in a row - something Federer was never able to achieve. Comparing the careers of Federer and Djokovic is more interesting to me than that of Nadal. 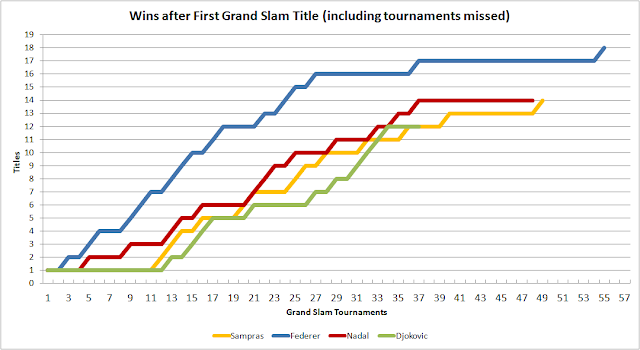 Nadal with his French Open dominance never has had the consistency across the slams as has Fed and Djokovic. 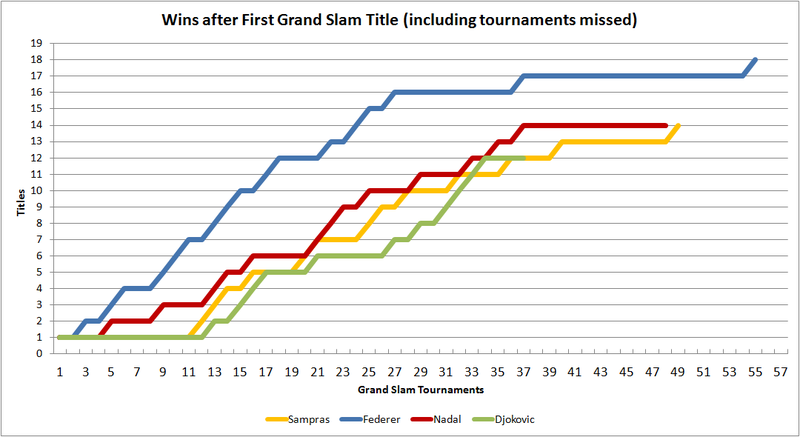 In "only" 3 years has Nadal reached the quarter finals of every slam; Djokoivc has done it in 6 years and Federer in 8. If you took away each of the three player's best slam, Federer would lose 7 Wimbledon titles and still have 11 slams; Djokovic would lose 6 Australian Opens and still have 6 slams, while Nadal would lose 9 French Open titles and have only 5 slams. 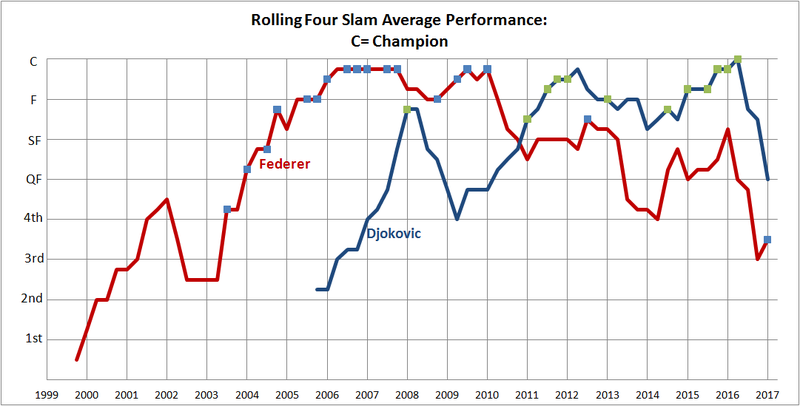 So Nadal is certainly great, but for comparing all-surface careers, Federer and Djokovic are much more similar. When Djokovic won his second Australian Open title, Federer had already won 16 grand slam titles. Since then he has won 2 and Djokovic has won 10 more. The impact of Nadal was not as stark. When Nadal won his first non-French Open slam in 2008, Federer had already won 12 titles, but he would still win 4 out of the next 6 before dropping off. 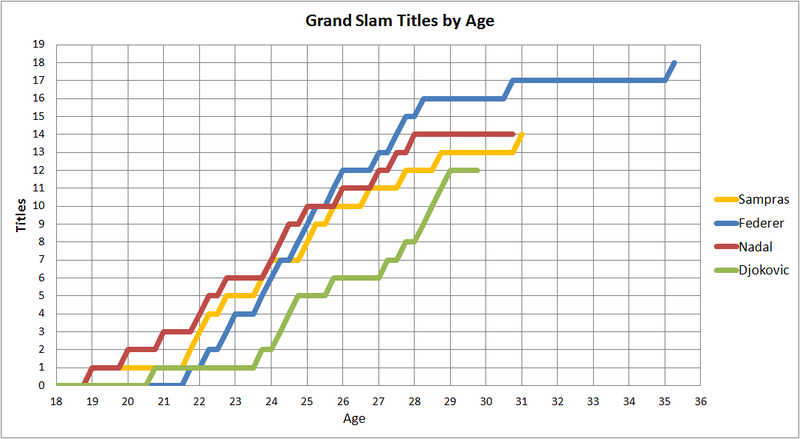 It also shows how tough it is for Djokovic to get to 18. 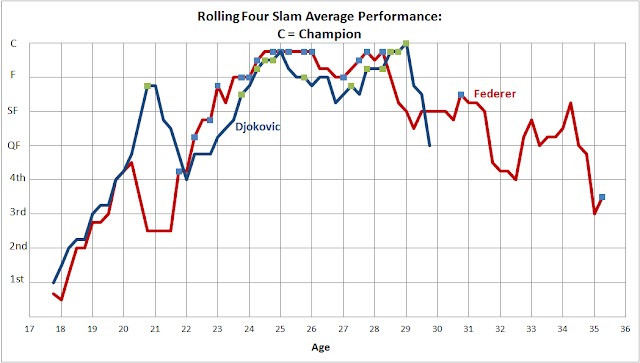 By the time Djokovic won his second title, he was at an age at which Federer had already won 5. 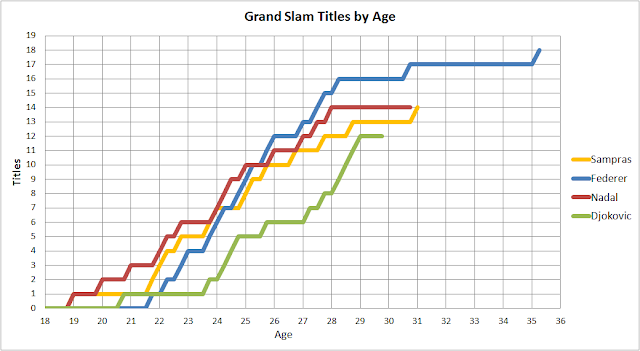 The chart shows pretty clearly that the peak age for a tennis player is from 23 to 29. During that period Federer won 12 titles, Djokovic 11. So Djokovic needs to make up for his slower start and that one less title during the peak years. And while Federer dropped of a touch earlier than did Djokovic, the fall was remarkably similar, and if anything Djokovic's had been more sudden. After Federer won the Australian Open in 2010 his next 4 slam performances were: QF, QF, SF, SF. Since winning the French Open last year, Djokovic has gone 3rd, F, 2nd. Will the French Open see the continued drop off or will he recover? Sport is a damn funny thing. When Federer won that 2010 Australian Open he had made the final of 18 of the previous 19 slams - an unheard of level of dominance. People were talking about 20 slam titles. And then he only reached 3 of the next 19 finals and only won 1 of them. The path does not look good for Djokovic. But one thing he has in his favour is that unlike Federer, there is not a Djokovic around about to come into his peak. The only other slam winners (besides Fed and Nadal) playing the tour at the moment are Wawrinka, Murray, Del Potro and Cilic. They are aged 31, 29, 28 and 28 respectively. Dimitrov is 25 and looks to be ready to make the leap to champion, but he is a very long way from being one of the 5 best players of the open era (something that Djokovic is legitimately in the discussion of). But that said, slams don't need to only be won by one person, or split between two (or a "Big 4"). Maybe Dominic Thiem (aged 23) will begin his rise to the top, or Sasha Zverev (still only 19) or Kygios (21) or maybe Tomic can turn things around (at 24 and ranked 33, there's still time to avoid "journeyman" status, but less than there once was). My gut is that we're about to enter an era were having 3 or 4 different winners and 6 or 7 different finalists in the slams each year is not uncommon - a bit like the period from 1996 to 2003. But then, who knows. I'm the guy who said he was going to stop caring about Federer in 2009.